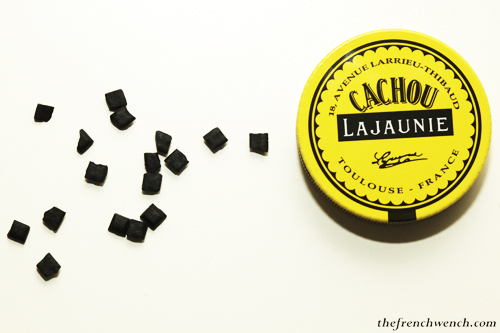 As a kid growing up in France I was never without my tin of Cachou Lajaunie, some tiny liquorice lollies that made my tongue completely black! Every time I go back to France I make sure I buy a few little boxes to take a bit of this Toulouse specialty home. Cachous have been around for ages, but were mostly made famous in the 80’s by this really short but efficient ad, named “La Belle de Cadiz”! The director David Niles consequently won a “Commercial of the Year” award for the ad, which has since acquired a real cult status. Not too bad for only 3 seconds! Cachous come from the Areca Catechu (Betel nut palm), a tree found in East India producing Betel nuts. The paste extracted from the nuts is then boiled and filtered, and the result after evaporation is the cachou. Its virtues are similar to nicotine: hunger suppressant and stimulating. 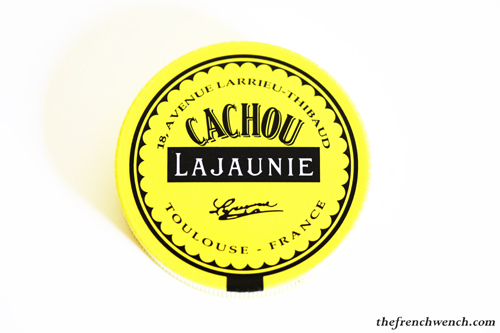 Reformulated by pharmacist Léon Lajaunie around 1880 in Toulouse as a breath freshener for smokers and for general oral hygiene, the cachou belies its size by packing a punch of flavour, thanks to a savant combination of liquorice and mint. The design of the round tin was created by a clock-maker friend of Léon, so that it conveniently fits in a watch-pocket. Léon was business savvy and marketed his product very well; he set up one the first in-store advertisings on an enamel sign. 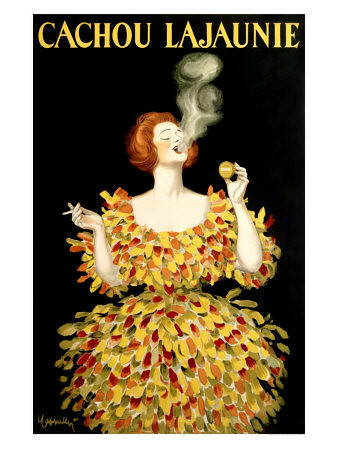 Later, the famous poster artist Leonetto Cappiello also designed beautiful signs for the Cachou Lajaunie. Léon’s efforts seem to have paid off, as the Cachous Lajaunie were an instant success! In 1904 he sold the formula and brand to the Sirven family, who expanded the business even further. A few decades later, Cachous Lajaunie became part of the Cadbury-Schweppes group, and were recently bought by Kraft Foods. For all these reasons, the Cachous Lajaunie have become a cultural icon and it looks like they are here to stay, with millions of these little tins sold worldwide every year! This entry was posted in French Specialties and tagged Cachou, Liquorice, Lolly, Toulouse. Bookmark the permalink. Hi Sara! The tin contributed a lot to the success of the cachou apparently, it is indeed pretty clever! I must make a note of this and grab myself a tin when next in France. I love liquorice so I’m bound to get addicted to those! Merci pour ton message Corinne! You should also try the lollies Stoptou if you’re a fan of liquorice, they’re addicitive! Hi Lorraine! Love that poster too, I almost bought one online after that! I cannot find many European licorice candies here in the states this year. I wonder if there is a shortage or import restriction? Mmmm, not sure about that, will look into it! My husband is a LaJaunie. Wonder if he is related to the founder/inventor who created these candies. Tchik-tchik les Cachou ma chouette!